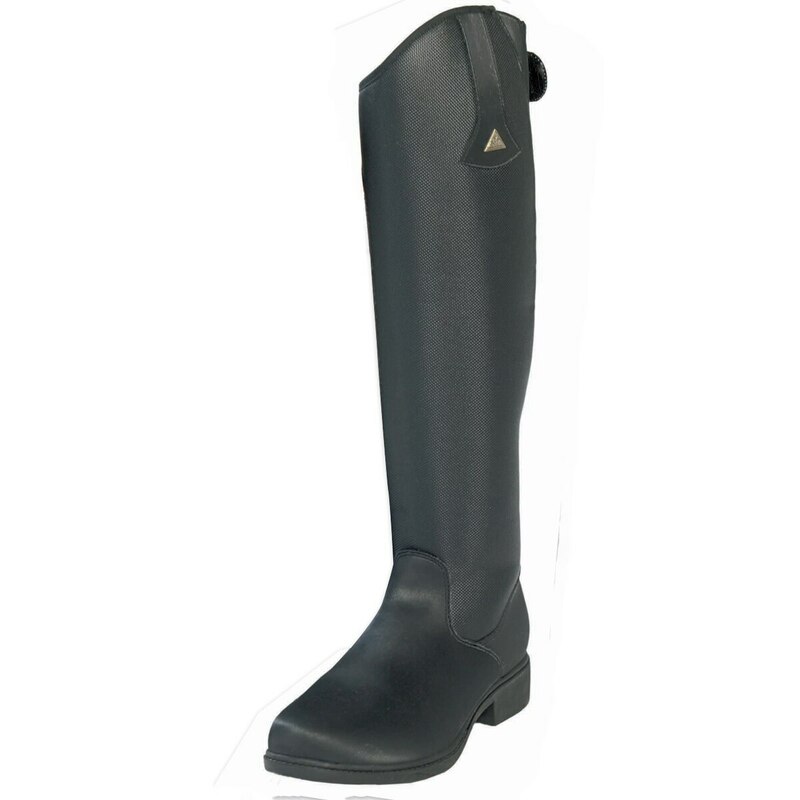 The Mountain Horse Ice Rider Tall Boot has a tall, sleek look and elegant features. Upper boot is made from strong Duralon™ with heat insulating Thermolite® lining to keep your legs warm. Durable elastic material inserts along calf area for improved individual fit and allows room for some extra winter layers! In addition to being warm, this boot is both breathable and waterproof thanks to the HYDRO-Tx membrane. 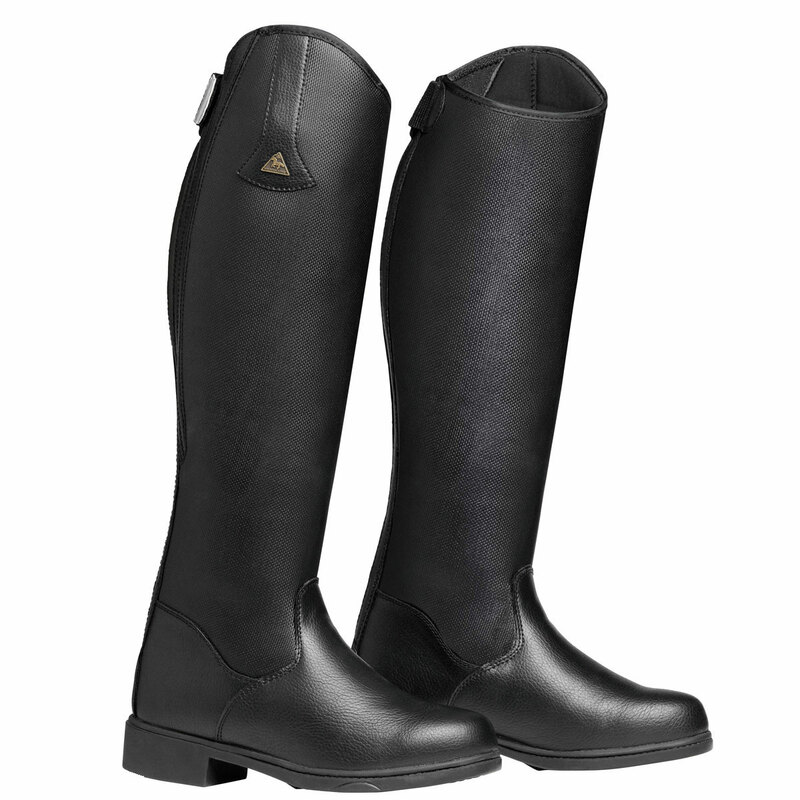 Technical and stylish, this riding boot will keep your feet dry and warm in or out of the saddle! Stirrup Control System™ with enhanced grip will help you maintain correct stirrup position as well as increase traction on snow and ice while on the ground. Mountain Horse Ice Rider Tall Boot is rated 3.9 out of 5 by 97. Rated 4 out of 5 by Appy Girl 1 from Mountain Horse Ice Rider Tall boot I bought this boot for next winter. I have always had the Mountain Horse paddock boots for the winter and I love them. They keep my feet warm and dry. I hope these boots do the same! Rated 4 out of 5 by Georgesmom from Better than expected! I wear a 9 in running shoes and a 8 in my Ariat tall boots. Ordered these in an 8 and they were way too big. Exchanged for a 7 and the fit was much better! Still a little big around the ankle but not too bad and probably will be more snug with a better pair of socks. I ride five days a week and so far have been pleased with the fit of the boots for both dressage and jumping. They kept me warm when it was 30 degrees but were not uncomfortably hot when it was 60 degrees. So far they have been very water proof and held up well. Overall I was concerned these would be too bulky for everyday riding but they really have exceeded my expectations and been much nicer than I thought. Rated 4 out of 5 by CS22 from nice boots I loved them but they were too tall for me - I sold them to a friend and she loves them. They were also slightly tight for my calves. Rated 5 out of 5 by addie21 from So warm! I ride in Michigan and my old boots just didn’t cut it. My feet were so cold it hurt every time I went to the barn. Now, with my new boots, my feet are always so so warm!! It’s crazy! Not cold at all. They fit my spur, and into my stirrup. To all the reviewers that said the boots were too tight/stiff: they are at first but after walking for like five minutes they adjust perfectly!!! They stretched right out. The Velcro has survived super well, and I have plenty of room if I ever needed an extra sock. Flexible, sharp, waterproof and WARM!!! Absolutely love the boot. Defiantly recommend. Rated 4 out of 5 by Linda from Good winter boot so far I only have a few rides in these but so far I am happy with them. I mainly got them because I needed a warm boot as my feet getting cold keeps me from riding below 40F. These definitely are warm. (Disclaimer: I'm not in a really cold place). Other positives are that they broke in quickly. At first they were stiff to walk in and hit the back of my leg but only a couple of outings and they feel very comfortable. The length is just right for my leg. Although they are a bit bulky (the price to pay for warmth I guess) they do fit my regular stirrups so that is also a plus. The only negative so far is that they squeak really badly against my Wintec saddle. Rated 2 out of 5 by Brigette from Good Fit, Pretty Warm, Sadly Don't Last This is my second pair of MH Ice Riders. The first pair lasted 3 years, before starting to let water seep in. Even when they started to leak, they still looked perfect. This latest pair, however, have cracked on the top of the foot, right where my toes bend. I've only just started wearing them for the second season, and they're only 10 months old. Very disappointed, since I hadn't budgeted to buy another pair of these for at least a couple more years. Rated 5 out of 5 by mslily from So warm. So comfy. Michigan is famous for winter tundras and swimming lessons all in the same week. When those tundras come through, you don't want to be caught without appropriate footwear. I had my old Mountain Horse boots for over ten years before I needed a new pair. I was very attached to the old style and struggled with the decision to buy these, but I am so very glad I did. These boots are very warm and cozy. They have been great for chores, great for catching unruly horses in the snow, and great for riding. I was able to break them in well after a week of chores and light winter riding. I'm much less worried about this upcoming winter knowing I have these guys in my trunk when that first snow hits. Rated 5 out of 5 by Stef4r from Love these boots! Absolutely love these boots. A little stiff but see these being my go to boots! Rated 5 out of 5 by Kim n from Great price Gave these to my daughter for her birthday. She said they are comfortable and warm. They look great on, not too bulky. Rated 4 out of 5 by Tanman from Warm and toasty feet! So far these boots are great! very warm. 4 stars b/c they are a bit too tall as of now but I think as they break in they will fit nicely. Like them also b/c I can wear my spurs with them. My other winter boots were too bulky for that. Great price too!